In this tutorial, we try to reproduce some old jellium calculations by Lang and Kohn [Lang70]. 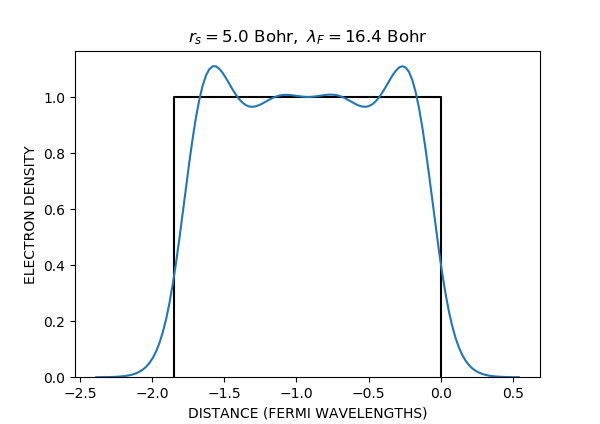 Let’s do a calculation for \(r_s=5\) Bohr. We use a cubic cell with a lattice constant of \(a=1.6\) Å, 8*8*8 grid points and and a k-point sampling of 12*12*12 points. In the text output from the calculation, one can see that the cell contains 0.0527907 electrons. which is reasonably close to the value from Lang and Kohn: 100 ergs/cm\(^2\). Input: charge, the total Jellium background charge. Choose which grid points are inside the jellium. Return ndarray of ones and zeros indicating where the jellium is. This implementation will put the positive background in the whole cell. Overwrite this method in subclasses.